It was the time when terror enveloped the whole of Sri Lanka. 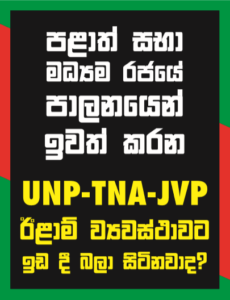 The JVP’s second insurgency was raging. Many were the sacrifices made to appease the demons in human form. They were celebrating and enjoying life while murder squads under their direction were roaming the country looking for prey. Torture chambers were setup at different places. People died by the thousands after suffering brutal torture. Bodies of victims were seen everywhere. They were burnt or dumped in rivers and canals. The buildings which housed the torture chambers were (1) state institutions, (2) private houses which were rented (3) public places and (4) housing complexes. Outside Colombo the infamous ones were at Eliyakanda Matara, Pelawatte, Mahaweli Housing Scheme opposite the Embilipitiya National School, Soranatota Estate Kalutara, Walawwatta Galle, Community Centre Angunukolapelessa, Ekanayake Medirigiriya, Pelvehera Government Farm Dambulla, Haliela Motors Garage Badulla, Polwatte Chilaw, Weligama Camp, Thalalla Workers Vocational Training Centre Matara, Hilltop Galle, Kotigala Galle, Unagaswala Karandeniya, Bombuwala Kalutara, Siyambalanduwa Monaragala, Muthukandiya Project office near 4th Mile Post Ampara, Polgolla Cooperative School, Batheegama Estate, Wickramasinghe Bangalow Kegalle, Beragala Summer Fashion Garment Factory Haputale, Nuwara Eliya Town Hall, near the Syambala tree across the river close to the Pallekela Camp (today a hotel has come up there), Wehera Kurunegala and Lindula Tea Factory among other places.